The Bingham Diaries: Ni Hao, Kai-Lan: Kai-Lan's Great Trip to China! Ni Hao, Kai-Lan: Kai-Lan's Great Trip to China! Preschoolers can pack their bags and join Kai-Lan on her greatest adventure yet! 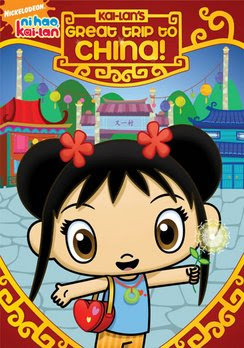 Kai-Lan and her friends take on a new continent in the all new Nickelodeon DVD release, Ni Hao, Kai-Lan: Kai-Lan's Great Trip to China! In the double length feature, Kai-lan and her friends travel to China to meet a baby panda. During their journey, they are amazed by all the new things they learn about Chinese culture. Two more episodes are included on the DVD. In Rain or Shine, your kids will help Kai-lan and friends figure out things that they CAN do in the rain; in The Ant Playground, they'll help Kai-Lan and friends see the ants perspective so they can help to build a swing for the ant playground. Want to join Kai-Lan and friends on all her adventures? Good. Because I have a DVD for you to win. 3. Subscribe to this blog, or follow it, whichever it is that you do, then come back here and tell me. 4. Tell me which of the Kai-Lan characters you like best and why. Contest will close Monday, July 20, at 12 noon EST. Winner will be chosen at random and announced that night.